The Arch Mission Foundation is sending a "Lunar Library" to the moon in 2020 on a private Astrobotic lunar lander. The library consists of tiny discs of laser-etched nickel and includes the contents of Wikipedia and much more. A private lunar lander's maiden moon mission just assumed a new dimension: helping to preserve some of humanity's precious cultural heritage. A "lunar library" created by the nonprofit Arch Mission Foundation will be among the payloads toted to the moon by Astrobotic's Peregrine lander in 2020, representatives of the two organizations announced Tuesday (May 15). "We're thrilled the Arch Mission Foundation has selected Astrobotic," Astrobotic CEO John Thornton said in a statement. "It's humbling to think our mission to the moon will deliver something that could be read millions of years from now. Arch's lunar library will be a monument not only to human knowledge and culture, but also the first commercial mission to the moon." An artist's illustration of Astrobotic's Peregrine lander on the surface of the moon. Peregrine is scheduled to fly its first lunar mission in 2020. 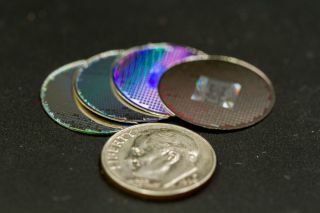 The lunar library consists of thin sheets of laser-etched nickel — an analog microfiche that's easily readable by a 1,000-magnification optical microscope. Nickel isn't appreciably affected by space radiation or the moon's temperature extremes, so the library — which contains the equivalent of millions of pages of text and images — will likely last billions of years, Arch Mission Foundation and Astrobotic representatives said. The 2020 mission won't be the first time the foundation has launched data into space; an Arch Mission "data crystal" containing Isaac Asimov's seminal Foundation trilogy of sci-fi novels flew on the maiden mission of SpaceX's Falcon Heavy rocket this past February. "Through massive replication around the solar system, we will be able to guarantee that the Arch Libraries will never be lost — even millions to billions of years in the future," Nova Spivack, co-founder and chairman of the Arch Mission Foundation, said in the same statement. "We can definitely preserve our unique cultural heritage and biological record in a way that will survive for millions to billions of years, and that has not been possible before," Spivack added. "We see the lunar library as the ultimate in cold storage for human civilization." Pittsburgh-based Astrobotic aims to provide cost-effective and frequent transportation services to the lunar surface for a variety of customers. Peregrine will tote a number of payloads on its first moon mission, including a scientific instrument provided by the Mexican Space Agency; two small moon rovers; cremated human remains (for a "moon burial"); and several other data-storage devices and projects, including some time capsules.